In May there were a large number of ranking points on offer, with very few events expiring for the world’s top players, this resulted in a forward movement for many players and unfortunately a backwards step for those who did not make an impact during the month’s competitions. When analysing the World Rankings it is important to see the full picture, which takes into account results from the last 12 months (excluding the World Table Tennis Championships). Those who make strides in May could see it all crumble soon when last June’s results expire. To keep a steady competitive ranking, players must be forward thinking and attend at least eight events on the ITTF calendar per year. With two events expiring from June 2017 Ma Long will not be able to make a forward move in the rankings. Last year Ma Long was the winner of the Japan Open, if he defends his title he will still drop 1350 points from last year’s China Open Round of 16 finish. He will once again have less than eight results to bolster his world ranking points. Runner-up in Japan last year, Fan Zhendong will face a much smaller drop in points due to his larger stockpile of results, when one drops out of his top eight another fills the space while Ma Long has no such buffer at the moment. In fact, if Fan Zhendong is able to equal last year’s performance in Japan he will not drop at all, since the other expiring event (2017 China Open) is not even in his top eight. Similarly there is a potential fall in points for Timo Boll, as with any player who performed well at last year’s World Tour events in China and Japan. With the cushion of his international results beyond the eight highest results which make up a player’s ranking points Boll will be able to remain fairly stable, especially if he performs well in Japan. Boll and fellow compatriot Dimitrij Ovtcharov can expect to move above Ma Long again regardless of the outcome. 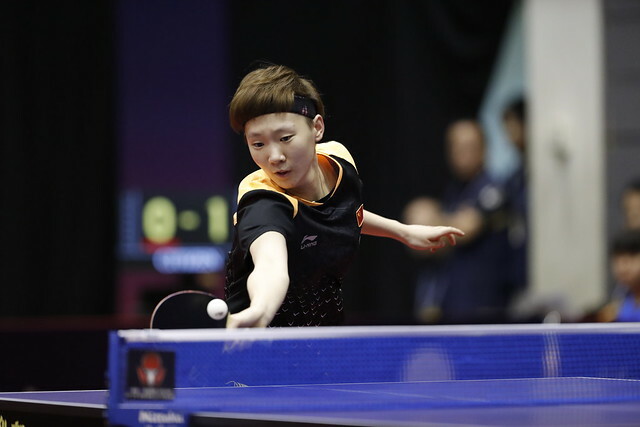 Japan’s rising star finds himself in the World top 10 at the age of 14 and will celebrate his 15th birthday on Wednesday 27th June – Harimoto has already beaten four of the players above him in the June rankings (Fan Zhendong, Timo Boll, Wong Chun Ting, Koki Niwa). Last year he did not make it out of the qualification stage in Japan, this time around he is seeded sixth. Harimoto’s semi-final result from the 2017 China Open will expire this month resulting in a drop of 720 points. However, depending on his end position in Japan he can dampen or reverse the effects. Winning his first match will give him 270 points, each subsequent round provides a further 225 points, reaching the semi-final will recover the full 720 points. Movement in the rankings is very much affected by the results of players above and below, making it a dynamic and exciting system. There is a potential opportunity for Wang Manyu to become the next #1 on the Women’s World Ranking list. Both Chen Meng and Zhu Yuling are missing from the line-up in Japan and have points expiring from last year. If Wang Manyu wins in Japan she will be the new #1, if she is runner-up she will be level with Zhu Yuling. Whatever the case, Chen Meng is sure to move below both of them. In a somewhat fortunate scenario Kasumi Ishikawa has no events expiring within her top eight, which means there is more potential for upward movement than the players ranked near her. Neither the 2017 Japan or China results were strong enough to enter her top eight. In order to increase her points tally Ishikawa must reach the semi-final in Japan, however, the gap between her and Wang Manyu (currently ranked third) is not possible to bridge. With her semi-final points expiring from the 2017 China Open, Liu Shiwen must achieve a semi-final berth to hold on to her current points. Even by winning the Japan Open she is not able to move ahead of Kasumi Ishikawa.